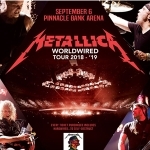 They dropped a few hints this past weekend and now it is official… Metallica’s WorldWired Tour is coming to Pinnacle Bank Arena! The fall/winter tour will mark a few firsts for the band. Each show will get rolling with the Light It Up pre-show party hosted by their very good friend Jim Breuer. Jim, along with a DJ to get the night rocking with some great tunes, hits the stage before the band with comedy, fan interaction, giveaways and much more. Of course, some things don’t change! As they have been doing for most of the WorldWired shows, every ticket purchased includes your choice of a standard physical or standard digital copy of Hardwired…To Self-Destruct. Keep it for yourself or gift it to a friend or family member. You’ll receive info via e-mail after your ticket purchase on how to obtain your copy. The enhanced experience options designed to take your Metalli-night to the next level are also returning as Metallica continue to partner with the team that makes it all happen at CID Entertainment. You’ll have three options of special enhanced experiences, including premium tickets and amenities ranging from early access to the venue and the “Memory Remains” exhibit of memorabilia to meeting some of the band(!) For full package details, click here. Don’t miss this chance to get your tickets before the general public with Pinnacle Bank Arena’s online presale, which starts Thursday, March 1 at 9AM and ends at 10PM. They dropped a few hints and now it is official… Metallica’s WorldWired Tour is coming to Pinnacle Bank Arena!